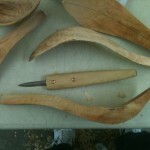 This last weekend on Saturday, took the ferry across to Kingston and spent the day learning to carve spoons at David A. Boxley’s. 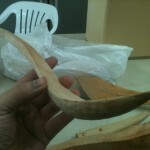 I only managed to carve out two spoons while Sensei Boxley knocked out 5 in about the time I took to do the first one. Humbling but instructive. Whenever I visit Boxley I always come away with a lot more knowledge and a better appreciation of what it means to be a serious artist.